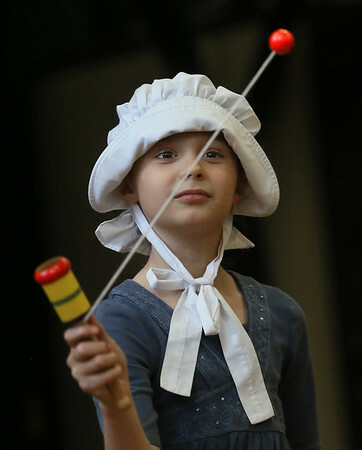 Third-grader Maggie Whitman plays with an old-fashioned toy while dressed as a pilgrim during Colonial Day festivities Wednesday at Essex Elementary School. The entire third grade class took part in the annual event. Students in Nicole Curcuru's social studies class researched the pilgrims, the Wampanoag, and the 1621 harvest feast that eventually became known as the first Thanksgiving. During the event Wednesday, the third-graders made johnnycake pancakes out of cornmeal, dyed fabrics with cranberries and other natural colors, played with Wampanoag and colonial toys, and learned other lessons about early American life.